The other afternoon, I was calling for my 11 year old son. He wouldn't respond, so I thought that he was up in his room playing legos or reading. After a little bit longer, he finally came to me. I told him that I had been calling him for awhile. He apologized and asked me if I would like to see what he had built in the garage. He loves to spend time in the garage working with my husband's tools. He likes to build things and fix things. He loves to organize and clean out there. Whenever my husband is out there he always has a little shadow. I should have known that he was out in the garage the whole time. In fact, there are some mornings when he will go out and work in the garage before school! 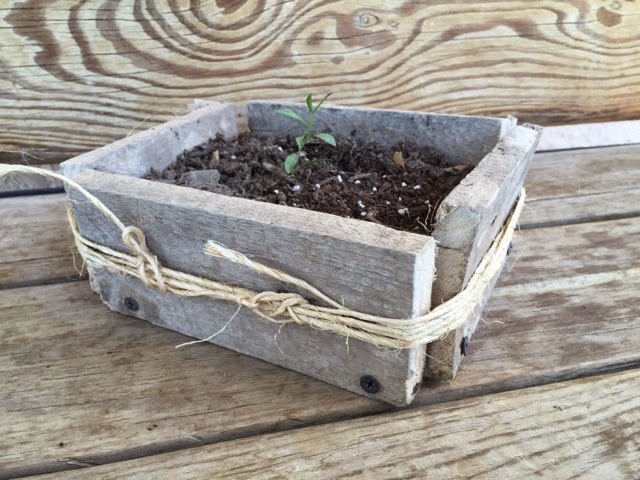 When he brought out this planter he made, I was completely shocked! A few days before, he found a little plant growing next to our potted climbing rose bush. 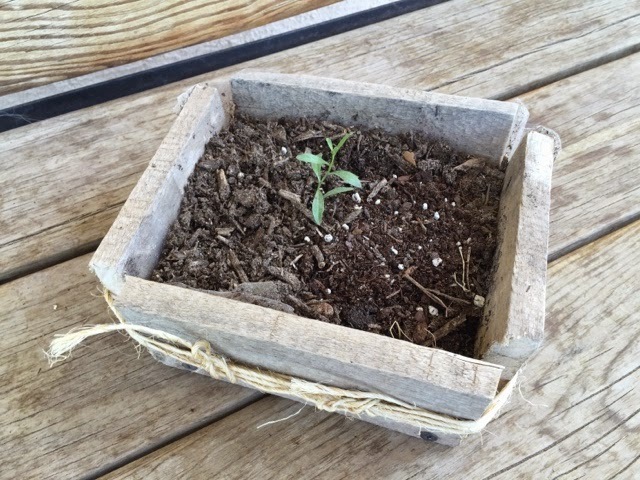 He rescued the plant and had been nurturing it in a plastic cup for a few days. I guess he thought it needed an upgrade! 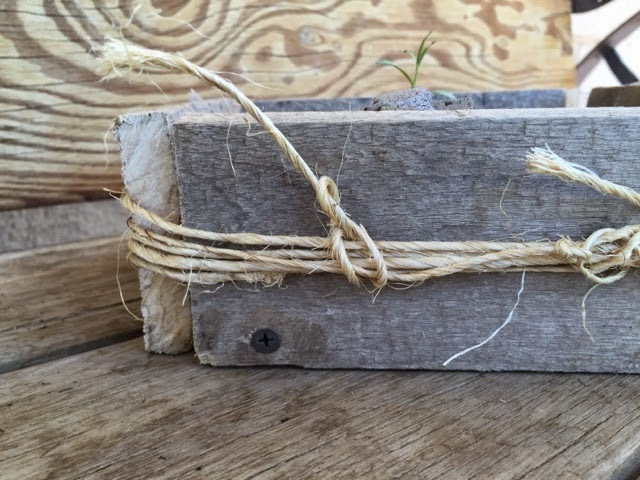 I loved how he used old wood to make the sides and bottom. He even drilled holes in the bottom to ensure proper drainage. 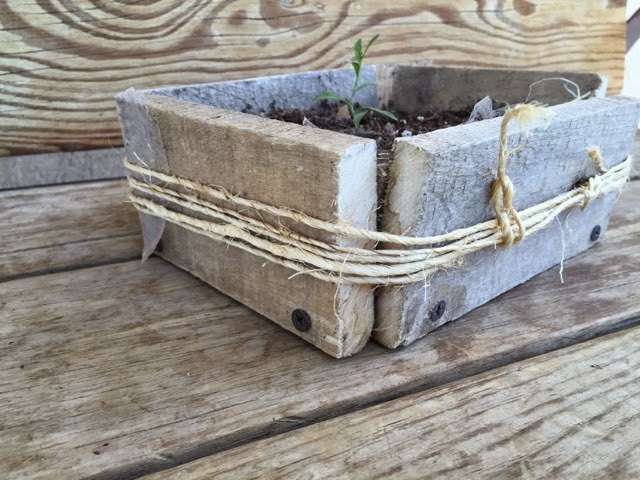 And I thought the twine he used around the planter was the perfect finishing touch! It was so cute and I was so impressed! It's a good lesson to remember: never to underestimate a child!